Update: added routine to print out hex data for blocks where entropy passes a given threshold. Update: GUI display of graph (using TK) was not working on my system. Code now saves an image of the results in addition to attempting to display with GUI. 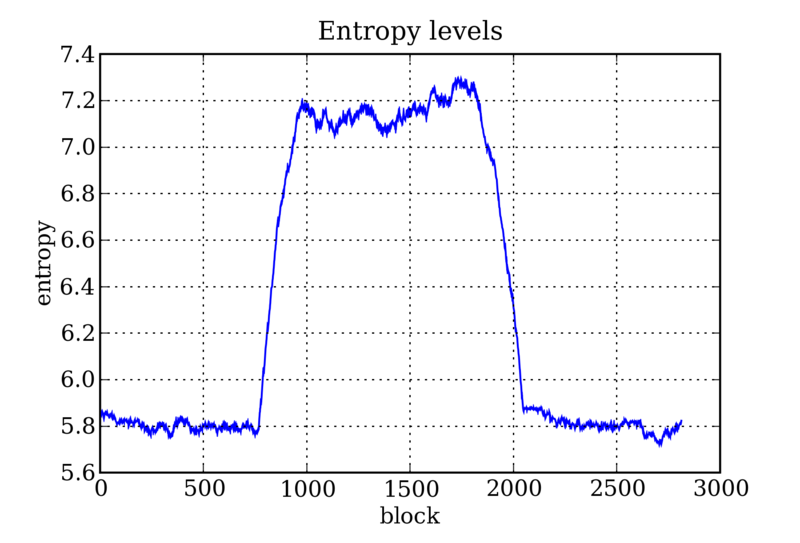 Update: These days I use a slightly modified libdisorder and gnuplot with tropy /bin/ls | gnuplot -e ‘plot “-” using 2:4;’. See submitted patch for details. Regardless, perhaps someone will still find the code from this article useful. Ero Carrera responded yesterday to a request on OpenRCE concerning using entropy analysis to find RSA keys and other random blocks of data in binaries. Here in is a full wrapper for the code he gives. We use matplotlib instead of Mathematica to generate the graph. Also if you plan to scan files larger than 100k I’d highly recommend downloading the modified progressBar class included here. SHOWPROGRESS = 1       # Show console progress bar? # that match will be printed. BLOCKSIZE = 256        # size of blocks scanned. print "File is a cached '.entropy' from previous scan"
print "saving cache of entropy scan data to %s" % filename+".entropy"
You may specify the progress bar's width, min and max values on init. min or max value as a default. """ percentString = str(percentDone) + "%"
first, so it will overwrite the current line in stdout.""" Is it possible to also release a version converted to exe (with one of automatic the converters) ? It would be excellent for those not having python running.. 10x!! as it turns out, making an exe would be, well a bit complicated. matplotlib uses a the numpy math lib which is rather large and i imagine more architecture and python version dependent then the entropy code itself. So, apt-get will have to do for most people… anyone is welcome to take this and make a c#, vb, whatevers, revision. Shub, i’d first want to update this small script with the corrections made in discussions on ero’s original post. then ill package it up nicely. sadly, it wont happen until after the semester starts. His name is Ero Carrera, not Ero Ventura, he deserves the credit.